Rick's Pocono Blog: Summertime Getaway in the Forest of Camelot! Summertime Getaway in the Forest of Camelot! Fabulous Newer Contemporary Lakefront Home in Magical Camelot Forest. Just steps away from the beach for swimming and also just 3 miles to Jack Frost Ski Resort for Winter Fun! Enjoy The 4 Bedrooms, 3 Baths, Wrap Around Deck w/Covered Porch, Pool Table, Air Hockey Table, Playstation 2, Hot Tub, High Speed Internet, Charcoal Grill, Stone Faced Fireplace, Foosball Table, Wet Bar in Family Room, Lots of Glass, Cathedral Ceilings, Stone (Propane) Fireplace, Modern Fully-Equipped Kitchen Plus Tastefully Furnished. Get yourself checked into a Pocono Mountain Rental Home for this already very eventful and spectacular Summer in the lovely Pocono Mountains! It's not too late! This home is located in the very private Camelot Forest, and it is only 5 or 10 minutes from Pocono Raceway, Francis E Walter Dam, Split Rock, and many other Pocono Resorts and Attractions! Camelot Forest is a Conservation Community in the tiny town of Blakeslee Pa. It is very woodsy, and it backs up to the Pocono Lake Preserve. This Community offers its residents an average size parcel between a half to a full acre and public sewers. Camelot Forest boasts 2 lakes, tennis courts, a nice beach, and it is located only 5 or 10 minutes from Jack Frost/ Big Boulder Resorts. 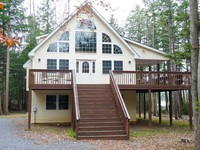 , and only 10 minutes from Pocono Raceway! Enjoy a Beautiful Weekend down at the Race Track of Pocono Raceway, and come back to your Pocono Mountain Lakefront Home Getaway! 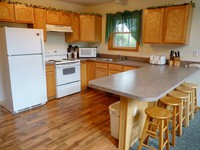 Beautiful Vacation Rental in Brier Crest Woods! A Great Home and a Great Price in Emerald Lakes! Latest Arrowhead Lakefront Masterpiece of a Home! The Brier Crest Rental Home Beauty! 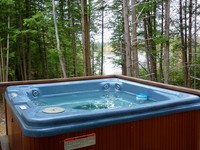 A Beauty of a Rental in Camelot Forest! Beautiful Raised Ranch in Towamensing Trails! The Lakefront Beauty on the Pa Gamelands! A Big Bass Beauty Rental For 4th of July Weekend! Happy 4th of July to the Land of the Free! The Big Bass Beauty For Rent! Musicals, Concerts, and Plays at The Sherman!